The 2010 Paris Motor Show set a number of records the least being that it premiered over a 100 new cars either in concept or production form and also included the most number of participating countries. Most interestingly was the fact that there were 12 million plus people that attended it and for those of us that were unlucky enough to miss it, we have the most interesting snippets from the show from amazing concept vehicles to futuristic green automobiles. 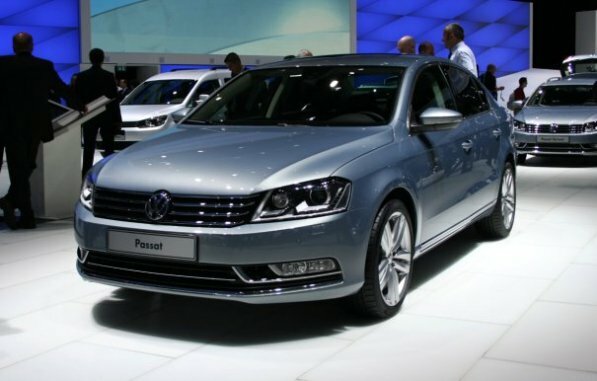 Volkswagen made a very quite but ultimately important debut at the French show by unveiling their new Passat which is expected to hit markets by the beginning of 2011. It is built on the same underpinnings and specs as the outgoing model, but this new version is completely reworked with aggressive styling. There are new headlights and taillights, front façade made up of a bold, chrome-accented grille and trendy fog lights. The interiors have also been redesigned and don a fresh, modern look. Available in the new Passat will be the 1.4 liter TSI, 1.8 liter TSI and 2.0 liter TSI petrol engines as well as a 1.6 liter BlueMotion motor and 2.0 liter TDI diesel engine. Transmission and gearbox will include the six-speed manual and six and seven-speed dual clutch DSG automatic. Lamborghini was aptly represented at the show having one of the most stunning display stands where they showcased their latest model the Sesto Elemento. Literally translated ‘Sesto Elemento’ stands for ‘sixth element’ referring to ‘carbon’, which is the sixth element in the periodic table. The car uses ample amount of carbon fibre making it very light weight and the intention of Lamborghini has been to get power-to-weight ratio comparable to that of a bike. The Sesto Elemento is powered by the same engine from the Gallardo Superleggera, which is the 570 horsepower behemoth. The weight of the car is down to 999 kgs and is lighter than the lightest Gallardo by a full 341 kgs. Astonishing 0-100 time of just 2.5 seconds should scare the bejeebers out of anyone. Be afraid…Be very Afraid!!!! BMW was able to showcase two of its more interesting offerings – the 6-series concept and more importantly the new X3. 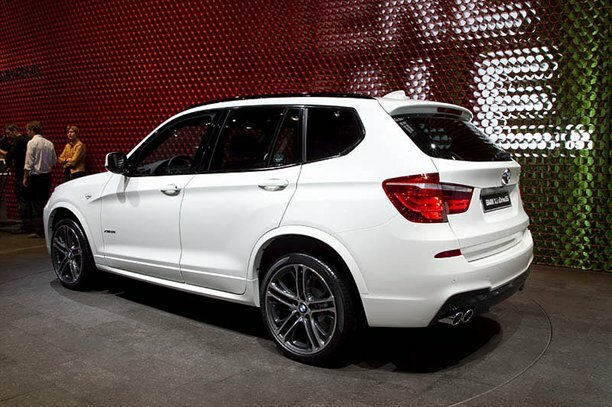 The new X3 has grown in size and has become like a little brother to the X5 getting a smarter, larger feel to it. The front end is also slightly more boxy with a few more aggressive lines and creases. The inside of the new X3 also affords more space than the outgoing model with some better styling as well. An exciting addition to the new X3 is the inclusion of a variable damper control, which allows the driver to tweak the steering response, suspension, throttle response, etc. These features should excite buyers looking forward to owning the Baby Bimmer. Along with the X3 was the concept 6-series which gets all new look. BMW has decide to finally stick to what it knows and have done away with the ugly looks of the present 6-series replacing it with a much better, elegant and more sharper styling. Though the showcase vehicle at the show was only a concept, BMW chief design supervisor, Adrian van Hooydonk, who is taking BMW design and styling to new directions, says that the final production vehicle is not going to be very different. Hyundai decided to use the Paris Motor Show to debut its latest version of the i20 the ix20. This car is supposed to play the role of the MPV for the Korean car manufacturer. 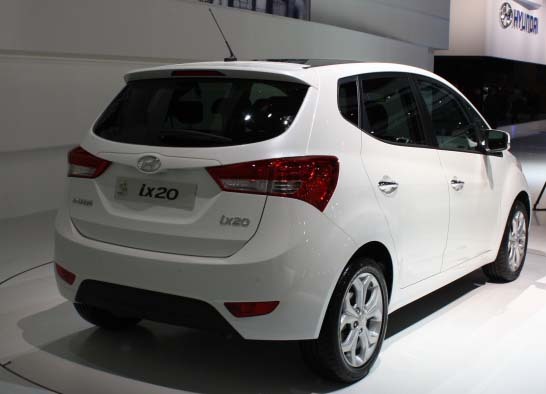 It has the look of a beefier i20 and its target market is a niche segment, which is why the ‘x’ tag is used. Hyundai has come up with a concept for their niche market cars and will give them an ‘x’ tag. The ix20 will be able to seat 5 people comfortably and will be available in 1.4 liter petrol and diesel versions. There is also news floating that a 1.6 liter petrol engine will be available but this will only come with an automatic transmission. There was also a very interesting little car at the Hyundai stand – the i20 Sport. This should be a car that excites quite a few people especially those in India and the car is fitted with a very sporty body kit. The i20 Sport Edition gets a body kit courtesy of Brabus, the independent car maker for Mercedes. It also has smoked-out windows, 17-inch Brabus wheels and a super sporty interior complete with bucket seats and racing steering wheel. There was no information regarding engine specs though and that was in all honesty quite a drag. Most exciting to see was the buzz at the Suzuki stand where the new Suzuki Swift was showcased. The new Swift is expected to be on sale in the early part of next year in Europe quickly followed by India. 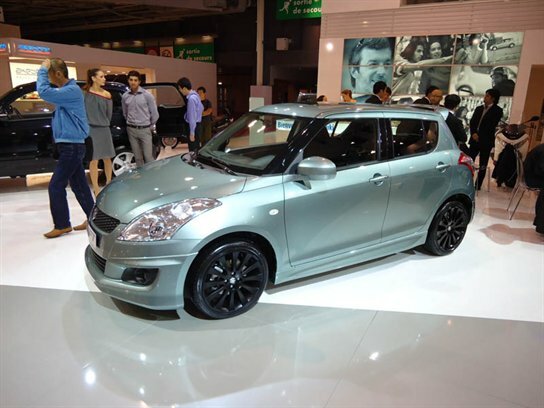 The new Suzuki Swift has is longer than the outgoing model is 90 mm longer overall having a 50 mm longer wheelbase. Suzuki claims that the handling and ride quality are better than the current model with better overall dynamics. The Suzuki Kizashi was also on show and will be eagerly awaited in India, having been debuted internationally earlier this year. The Chevrolet exhibition stand was one of the busiest ones around at the Paris Motor Show as the American car manufacturer choose to debut up to four new (or should I say newish) cars. These included the Aveo, Cruze hatchback, Captiva and Orlando models. 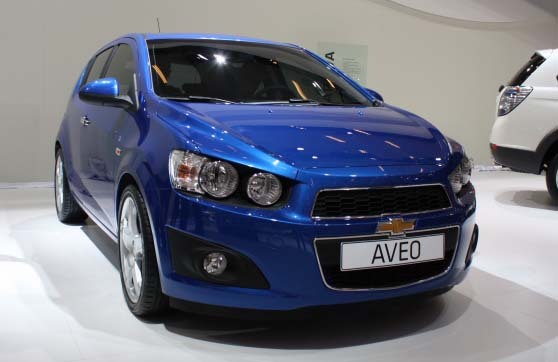 The Aveo was the most impressive as it featured the most upgrades and styling improvements from the current model. The car is now much longer, wider and has more interior space. The front fascia get a sweet uplift in the form of twin headlights, lower front bumper, rear door handles integrated into the C-pillar and an overall much more aggressive styling. Engine offerings are expected to be 1.2 liter and 1.4 liter petrol engines along with a 1.3 liter diesel motor. There were also pleasant facelifts for the Captiva and a new hatchback model of the Cruze. This should come as an exciting piece of news to the Indian market and hopefully we will get to see this version of the Cruze in the country soon. The new Captiva and Orlando are to be seen in the Indian market sometime next year. 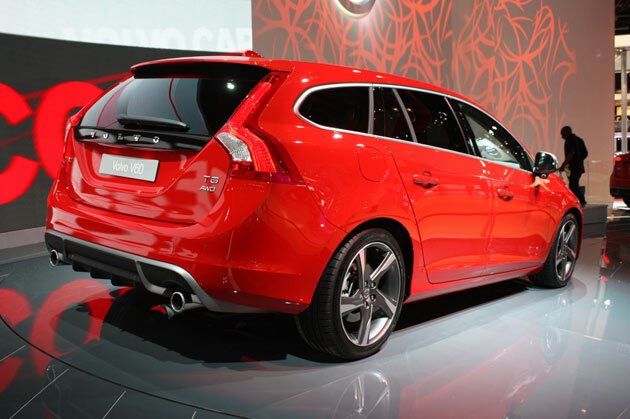 Volvo already showcased the V60 and S60 models and it took the opportunity of the Paris Motor Show to showcase the new upgraded R-Design version of the V60. The R-Design version gets an overall makeover with new exterior and interior design giving the vehicle a much more sportier look. The car comes with sports alloy wheels and also features a damper system which is new and provides sharper handling characteristics. The V60 and S60 models will come with all the engines currently offered by Volvo and should prove to be a decent success in the market. Mercedes-Benz was one of the more surprising exhibition stands this year at the motor show as they had three new production cars displayed but more surprisingly not a single concept vehicle. 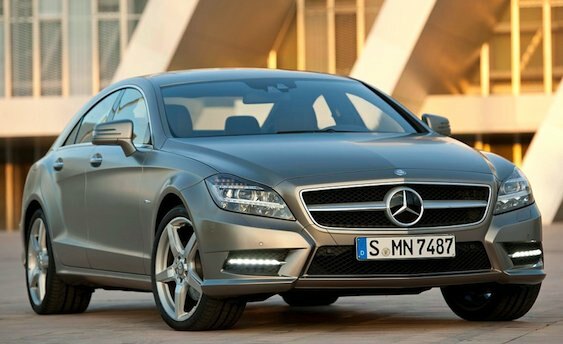 The new production cars included the CLS and S250 CDI models. The new CLS that was unveiled had all the new design styling and elements that Mercedes is moving towards in terms of its design concepts and we will soon see most Mercedes cars adopt the same styling and be applied to the entire range of vehicles from the German automaker. The front end of the CLS has an unmistakable SLS look to it with the chrome grille neatly accentuating the three-pointed star. The car should be available in V6 and V8 petrol engine options and the diesel versions should include a 3.0 liter V6 and 2.1 liter 4 cylinder unit. The newest offering in the S-class, the S250 CDI was also on show and comes fitted with a more efficient and green 2.1 liter diesel engine and AMG has provided a facelift. The S250 CDI BlueEfficiency is touted as being the most fuel efficient luxury production car by Mercedes and it is claimed to give up to 17 km/l.